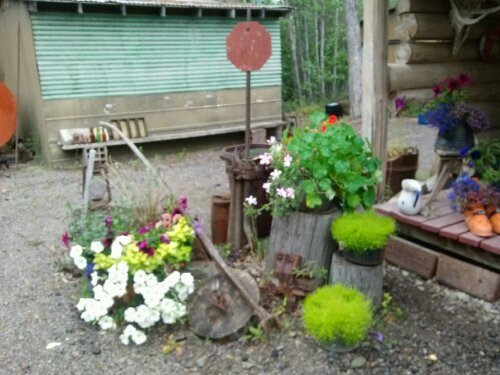 Over the next several days, our little art band, ate lunch and dinner at the Wrangell Mountain Center. We listened to great art lectures and ideas from Kristen Link. Kristen is very knowledgeable on botanical and scientific drawing and the science part of the naturalist field sketching. Most days we waited until after lunch to go on location. appointed rounds.” the US Postal saying comes to mind with our outdoor sketching class. The first afternoon was down by the river bed. Fallen cottonwood trees and feathery Dryas flower lined the rocky dry riverbed. It was mostly misty then turned to light rain. After a little while any a few short sketches. My watercolor sketches were a mess. 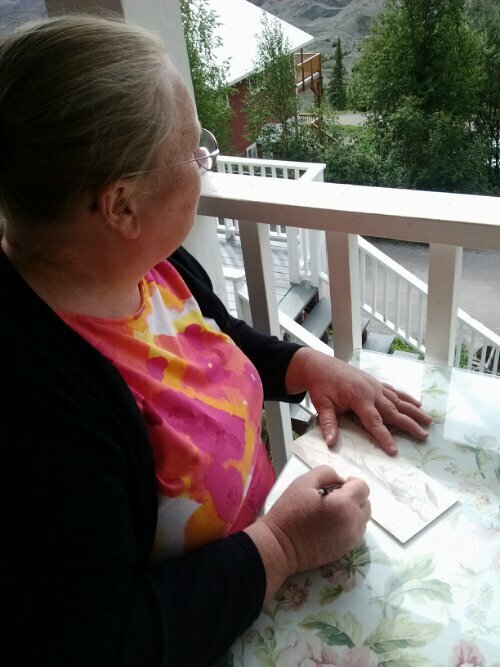 We went back to the warmth of the hardware store for a bit of food and to finish our sketches. Next day, we set off by bus to Kennicott with baged lunches and a few plastic ponchos. The light rain gave way to a steady cold rain. I was painting under my poncho. 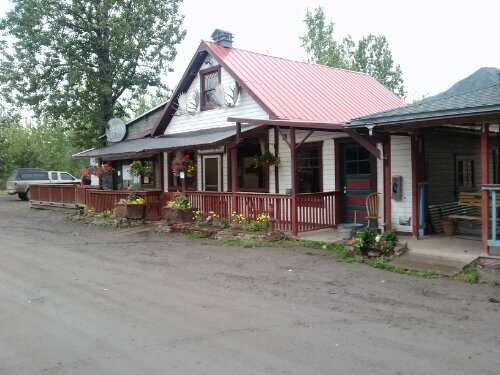 Rita had a great idea, she assured us the lady who runs the pizza bus in kennicott would love to have us use her tent. She also sells coffee and hot chocolate. Did not have to ask Carol and I twice. The three of us packed quick and hiked down the hill to hot drinks, yummy calzone and dry sketching place. Later we rode a very full bus of tour guides getting off duty, back to mccarthy. They said they we going to open mike night at Golden Saloon. Sounds fun. After dinner, our books dried out enough to work on them. More talk and friendship. 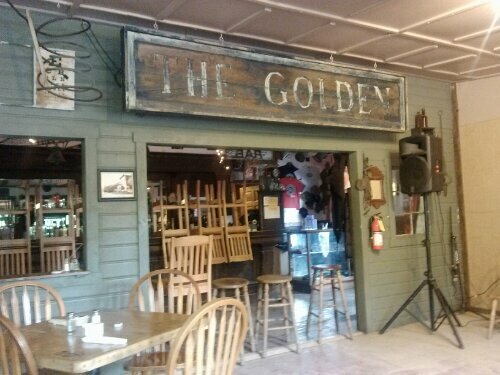 Yes, we went to Golden Saloon. Great fun listening to Michele sing some of her original songs. Next day! More rain even harder. 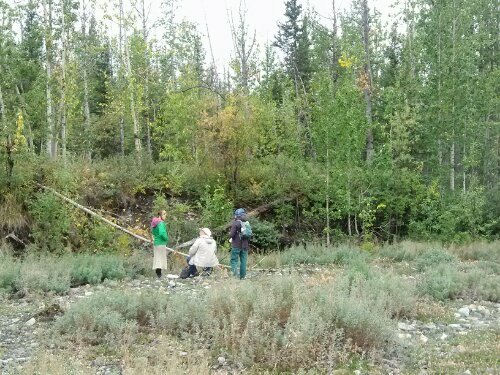 In the afternoon we set out to make a sketch map of someplace in McCarthy. 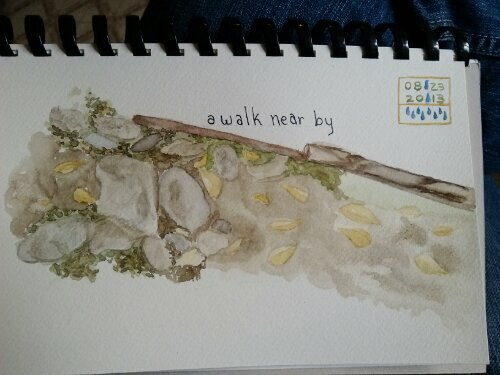 I did a little path near the hardware store. Later that night afterdinner we had a final art show. Rita brought her summer works of art. Beautiful painting of the moraines and mountains. Mount Blackburn and Fireweed painted in brilliant shades of pinks, blues and violets. Stunning, they are painted in the Cape Cod Style of art that uses colors to give painting depth and light. 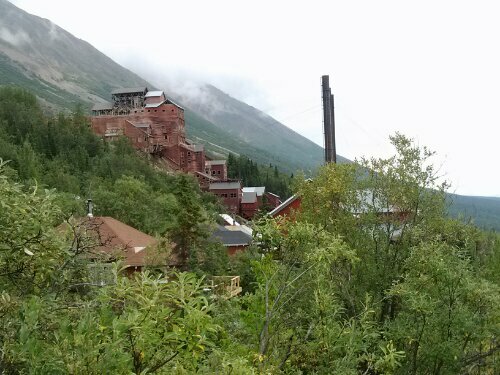 Afterwards, the sun finally broke through, Rita and her Husband drove Carol and I back up to Kennicott to photograph the mountains and the mines in sunlight. Wow! 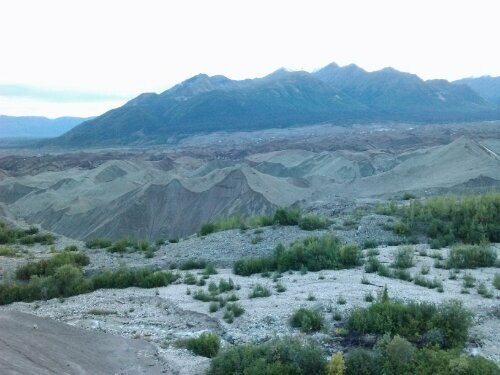 We watched the sun set over Kennicott and walked to the top of the hill to Silk Stocking Row. Manager housing for the old mines. Many of the homes are fixed up very nice.we walked back to cars and headed back to McCarthy. The four of us went to Golden Saloon for some snacks and drinks. What nice new friends. We said our goodbyes and off to bed. 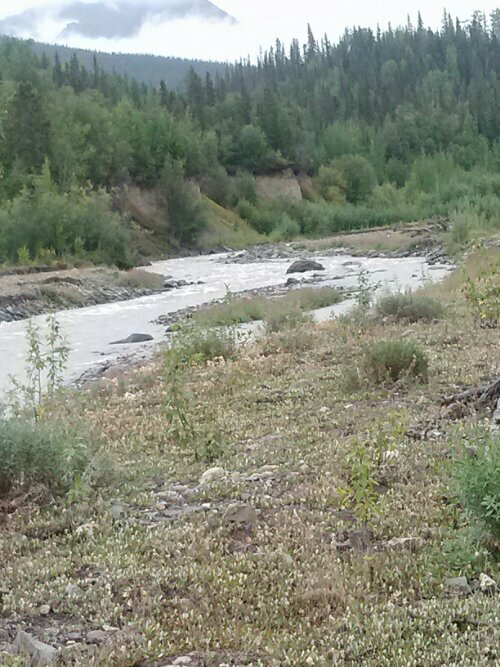 What a beautiful picture from Kennicott. We are still having some HEAVY rain! Guess we are paying for the beautiful summer we had. Sounds like you two enjoyed yourselves, despite the weather! Thanks Linda, it was a great trip. Carol and I loved meeting your fellow alaskans. I am looking forward to using my photos for watercolors. Weather is finally clear in Maryland.